Linus Tremaine posted this picture of a recent camping trip on FB. It's so neat I had to share it here. At first, I thought it was one of Rich's paintings. Great Steve. Black and white version? I can make a real tintype or glass plate negative if they ever come close to Rochester. If it wasn't for the Starbucks cup on the table, lol. No luck finding the film. The search feature doesn't work for me. 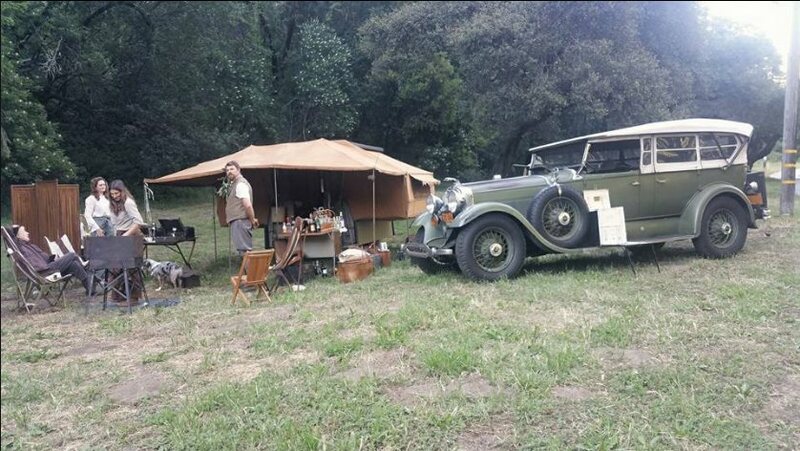 Is it staged just for the shot or are these people part of a group that does vintage camping? Steve, I found it by googling "cowboy movies 1913"
Sorry, I'm not literate enough to post links. It's worth the look, I think. Linus Tremaine, is a fine fellow that does read and post on this forum occasionally. He (on this forum) announced and invited people to join in on this years camping trip earlier this year. I do not know him very well, but we have had some very noteworthy mutual friends over many years. He and I have traded comments, postings, and a few email type messages on this and other forums over the years. Given a couple particular mutual friends, I do consider him to be a friend. I have not attended any of his camping trips, but know a few people that have, and they sound fantastic to me! I am still hoping to change that "not attended" soon. So many long-time friends in this hobby! The fellow standing next to the gentleman in the cowboy hat? The one with his arm reaching out, pointing? He was my best man when I got married over 40 years ago. And he is one of my very best friends to this day. A fantastic photo! I just wish I was in it. That looks like fun. The photo done in black and white looks even better. I find that modern card table just as jarring as the plastic mug. They had folding camp (card) tables back then.....I have them in an old 1920's Sears catalog. A fantastic photo no matter how you look at it. Don't bet on that being a "modern" folding table. Several people in that group have many of the real vintage pieces, including a folding table that that one could be (which I have seen back in the days I was actually participating in such events). I have three vintage folding tables myself. One of them I consider the "modern" one. It probably dates from the late '30s or '40s, but is very similar in its folding frame to the one in the picture. If that table is the one I think it could be, it would have a "roll-up" top that sets into the frame. The other two I have also have roll-up tops. If you look in the reproduction 1927 Sears catalog on page 499, is one of my tables (the rectangle shaped one), for $2.75. The other one I have is the more typical square shape (When taken out of its bag and set up). Both of them have wood slat tops sewn together so they can be rolled up and put into a carrying bag. 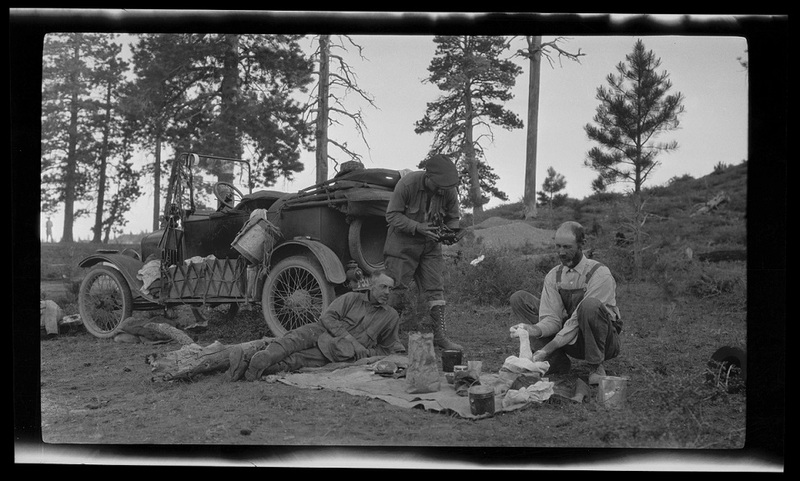 Vintage camping and picnics. 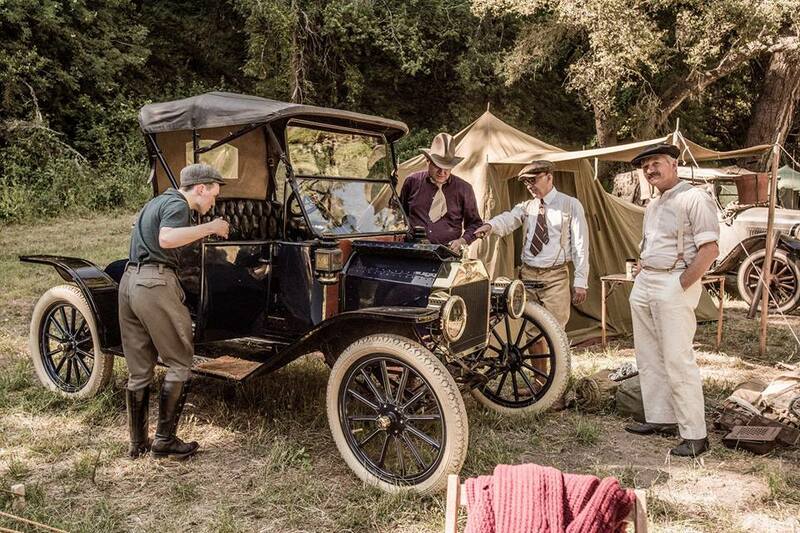 Just another way to enjoy antique automobiles! There you go! I love the photo as well. I take "reminiscent shots" of my T by old buildings and it is so hard to keep everything modern out of the shots. The thing i see in this very nice picture is the fact that these people are alive unlike a old org.Bud. Ha, you are in my world now Steve. If your print was made during the era of that car we would call it poorly fixed and washed at our museum. Most prints from negatives shot outside were essentially made on black and white developed out papers. The only time they had that brown with a slight yellow green undertone is when the silver was breaking down. The smaller the silver particle ... the warmer the color. And they would also be faded. So .... lighten your pictures density and reduce the contrast .. and you�ll have a good fake! Next time you see one of those amateur photo albums from the era that have the prints held onto black pages with black gummed corners (or actually pasted on to the black paper) look at the color of the prints. If you�re lucky you�ll see examples of the same type of print in both good (black and white) and poor (yellowish brown) deteriorated condition. The one modern thing about the picture that stands out for me is the use of a modern camera. 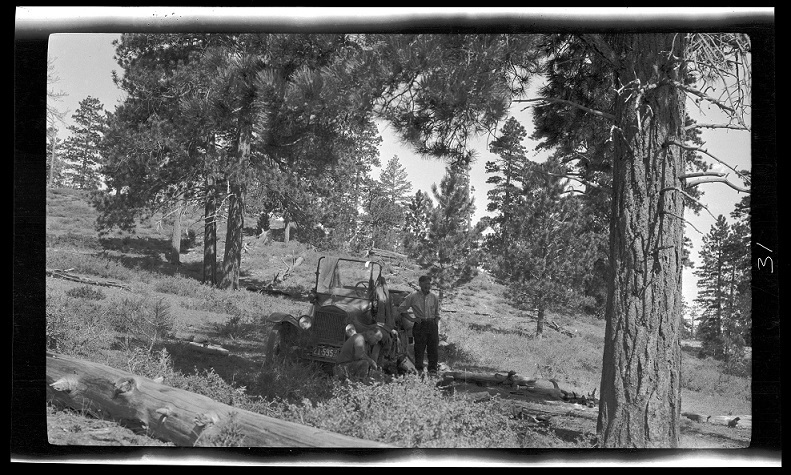 Yes, there were smaller format cameras in the Model T era, but shots like this were often made with a large format camera that produced a shorter depth of field. A good example would be a shot like this. Note the sharp subjects and out-of-focus background. Ford didn't make their rear windows that big in 1913. Good to see the modern coffee cup disappear in B&W photo. As for folding card tables. I had two period folding card tables that I just got rid of. The leg supports on one of them looked a lot like the one in photo. Steve, this is the original photo that I posted before I cropped it. This is another view of our campers, also uncropped. Hey Steve ... we are making 4x5 and 5x7 gelatin dry plate negatives today at the museum. The focus thing is really more about the lens opening than type of camera. But ... the larger the negative you shoot, the less you need to use an enlarger in the darkroom to make a big print. So with a 5x7 negative you can make a contact print. So if you shot the same picture with a 35 mm negative and wanted to make a 5x7 print .. you would need to projection enlarge it and the print wouldn't appear as sharp as the contact print. Yes, the larger the aperture the shorter the depth of field, and vice versa. But doesn't the focal length of a lens also influence that? Or is it solely a function of the aperture size? Just to clear the guesses. This photo was not staged and was taken during the Santa Cruz Horseless carriage club vintage campout held north of Santa Cruz,ca. 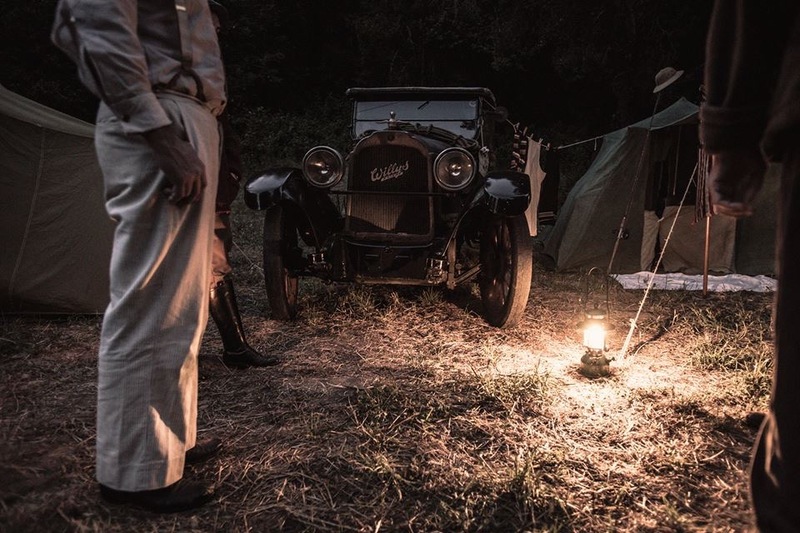 Spent two nights, vintage cars, vintage tents, vintage camp equipment, vintage clothes. About 12 camp sites set up. Brian was actually adjusting bands and tinkering with the T prepping for our drive up the coast for breakfast the next morning and the rest of us were just standing around watching and giving bad advice when Lindsey snapped this photo. Thats also my Willys Knight in the background. Oh. By the way, table is folding wood frame with a roll up top, period correct original item. Can't comment about a possible modern coffee cup...... but again, it wasn't a staged photo. We all were just hanging out having a great time. Here's another one of Lindsey's fantastic photographs taken at my camp.... camp poverty. Yep that's my undies and socks a hang'in on the clothes line. Todd M, "All were just hanging out having a great time." THAT, is the best way to enjoy this wonderful hobby! It is amazing how much more fun it is when people of like mind share all the bits, pieces, and do-dads of era stuff! 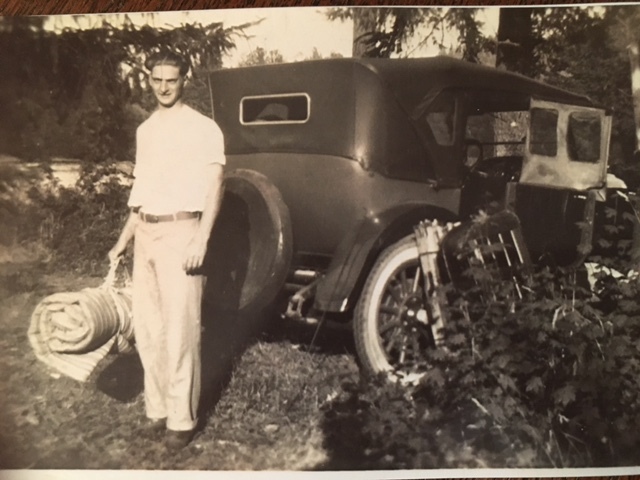 92 years ago this photo was taken of my 1923 model 64 Willys Knight. 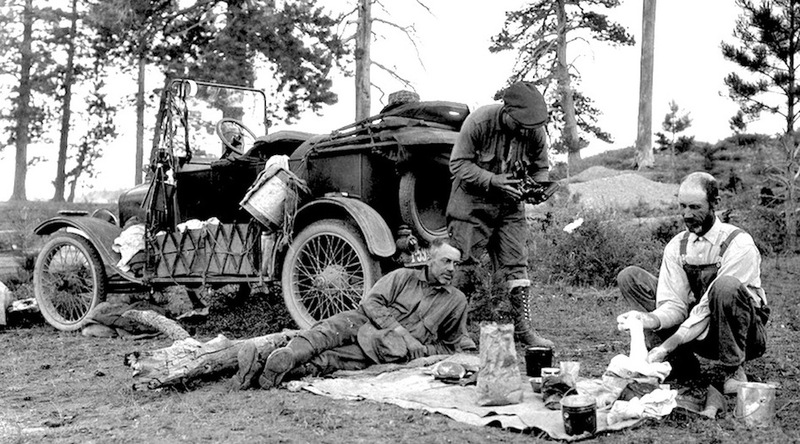 Here is Carl Jorns, the Knights original owner setting up camp during there drive across country in 1926. Carl bought this Knight new and he not only owned it the rest of his life but he never owned another automobile. I bought the Knight when Carl passed in1982. Hi Todd, I think your vintage camp group is fantastic. I used to do a traveling medicine show (for twenty years) from a folding stage out the back of my 1919 T. Google Dr. Bumstead�s Celebrated Lenape Liquid Show and click on pictures. Am just now putting together what you are doing to be carried by my �23 runabout. How heavy is that canopy tent in the first picture? Steve, Yes the smaller the lens aperture, the more depth of field aka focus in the image. Yes, the shorter the focal length the more inherent focus and more wide angle. The longer the lens (telephoto) the less focus and the more compressed the subject with the background. In either case ... if you want everything in focus the smaller the aperture ... and the longer the exposure. I need a bigger car !!! Todd.........no, a period correct trailer is what you need! Well Geo, Here at camp poverty I get by with my hand-me-down tent, torn cots, broken zippers so the raccoons can come in an cuddle if they want, hand me down clothes and chipped porcelain dishes. So I head down to the upper end of camp where the upper class folk are. There you'll find Linus and Max in there big Lincoln motorcars and fold out camp trailer. You get friendly and Linus will mix you up a mighty fine cocktail with hi class spirits in real glass and you can relax in fancy camp chairs and listen to fine music on that fancy portable Victor music machine he has. Mighty fine liv'in going on there, I'd say. I think this camp scene looks like a challenge for R. Eagle... If he hasn't already started! Bill Everett and G.R.Cheshire, thanks for thinking of me. I have enjoyed this photo in it's various versions and also the comments. A camping photo would be high on my list. Maybe when some of the T's are put away for the Winter. We had an umbrella tent like that in the 50's. Rich, Im with G R, Inspiration for a new painting? thanks for the compliments everyone. Hope you can all make it next year! One thing that is a total giveaway on that '13 runabout is the shape of the top.